Dr. Paul Edmonds performed his undergraduate at Utah State University while playing on an athletic scholarship for golf. He graduated with a B.S. in Bio-veterinary science and a minor in chemistry. He completed his formal education at Oklahoma State University where he received his Doctorate of Veterinary Medicine. He has been in veterinary practice for over 17 years. He has extensive expertise in general veterinary medicine as well as surgery, dentistry, reproduction, and ear cropping. Dr. Edmonds outside interests are primarily focused around his family. He has 3 boys and 1 girl that keep him very busy. Dr. Macdonald grew up on a ranch in Wyoming, and has been around animals her whole life. 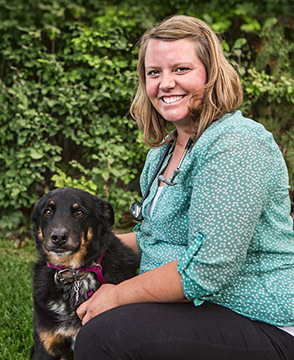 She graduated from Colorado State University in 2011 as a Doctor of Veterinary Medicine. She has worked at a small and exotic animal practice and a mixed animal practice before joining the team at Sandy Animal Clinic. She has two dogs and three horses. 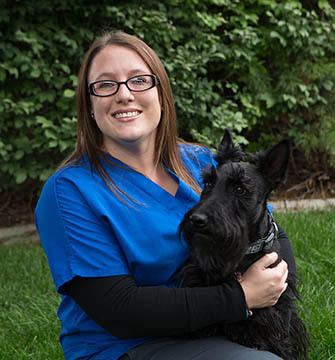 Dr. Macdonald enjoys spending time in the outdoors with her family and pets. Susan is the office manager for the Sandy Animal Clinic. She maintains and oversees the day to day functions of the clinic and works closely with the staff and Dr. Edmonds. She is the mother of four amazing children who keep her quite busy during her time outside the office. She also has three terriers that are very lively members of her family! She is an active member in her community and enjoys reading, plays (especially ones her daughter is in! ), and cheering on her sons at their baseball games, among other things. Jenny is an experienced graphic designer and illustrator but her passion for animals took her back to school to become a certified veterinarian technician. She joined our team in December of 2011. In her spare time she enjoys going up into the mountains with her horses, dogs and husband. She also fosters animals from time to time and is known for her pet pig, llama and donkey. Niki joined our practice in September 2014. She received her Associates in Applied Sciences from Utah Career College in 2006. Niki is an avid gamer, book reader and movie watcher. She enjoys spending time and traveling with her husband and three dogs, Klaus (weimaraner), Maggie (scottie) and Zero (havanese). Brittany graduated in 2009 with a Bachelor’s degree in Biology from Brigham Young University, but she has been working with animals for as long as she can remember. In fact, her first job was at a wildlife rehabilitation center in Georgia where she was raised. Upon graduating, Brittany had plans to move back to Georgia to attend veterinary school. She decided to stay in Utah for one last summer to enjoy the camping, fishing and hiking in the mountains, when she met a devastatingly handsome boy who persuaded her to stay. They are now married, and are the happy parents of a fat spoiled cat named Ruthie. Laura joined Sandy Animal Clinic a few months after graduating from Broadview University with an Associates of Applied Science in Veterinary Technology. She has always had a passion for helping both people and their pets and plans to continue her education as a marine biologist in the near future. In her spare time she enjoys watching basketball, painting and spending time with her Siamese mix Muppet and her chihuahua Ponyo. 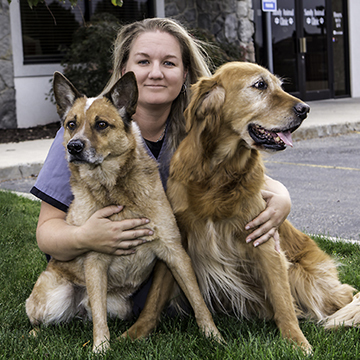 Kathy spent many years as a client at Sandy Animal Clinic and as of December 2010 became a member of our staff! As a kennel tech she is our background support and loves getting to know each pet and their owners. Kathy has two yorkies, Lily and Bella, a schnauzer, Otis and recently said a tearful goodbye to her beautiful 13 year old retriever, Sugar. As such she has firsthand knowledge of the importance of continued relationship with Dr. Edmonds and his staff. From the early years of a pets life throughout those soon to come years of age related special care that helped keep Sugar comfortable and happy through the last few years of her life.